Hillside, NJ – November 12, 2013 - National Entertainment Collectibles Association (NECA), entertainment conglomerate and global leader in licensed consumer goods, has partnered with 343 Industries for a new worldwide merchandise program for "Halo®", the award-winning franchise that has shaped video game and entertainment history. "We are thrilled to be part of a franchise with such wide-reaching impact," said Joel Weinshanker, president and COO of NECA. "Bringing the rich universe of Halo to tangible form is an honor, and we'll be working closely with 343 Industries to ensure Halo's loyal fans around the world are pleased with the result." The new line will be available to consumers beginning in April 2014, and will include a wide assortment of products, including 1:4 scale action figures, mini figures, DOT-approved motorcycle helmets, prop replicas, board games, and HeroClix miniatures games for a variety of platforms. A NEW ERA OF HALO® COMICS BEGINS AT DARK HORSE! One of the most iconic video game franchises in history comes to the number-one publisher of licensed comics! 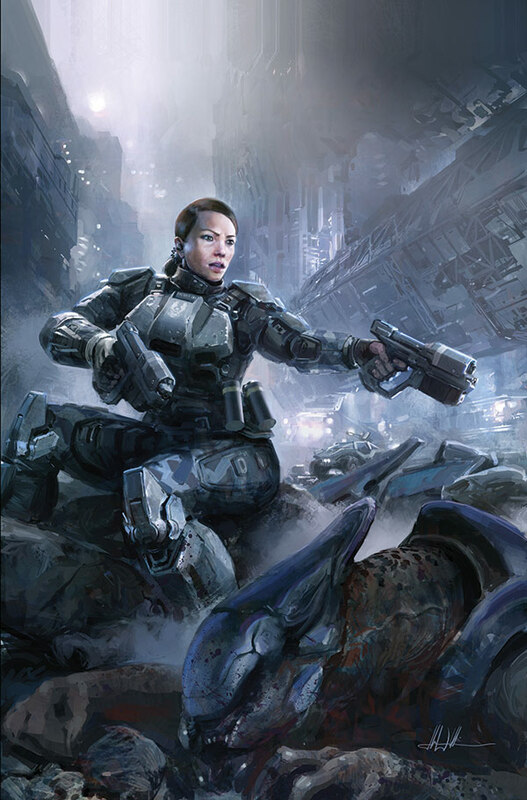 CHICAGO, IL, APRIL 26 – Dark Horse continues in the tradition of bringing only the biggest and best characters and story lines to comics with the announcement of the Halo: Initiation miniseries, launching in August! This exciting new miniseries will be written by Halo 4 writer and comics veteran Brian Reed, with art by Marco Castiello (Secret Invasion: Front Line, Star Wars: Purge)! Tempe, Ariz. - October 31, 2012 - McFarlane Toys has teamed up with Microsoft Studios and 343 Industries to bring you a new iconic collectable from the Halo universe. Leading up to the highly anticipated release of Halo 4, Microsoft created the live-action digital series, Halo 4: Forward Unto Dawn. This online epic live-action digital series delivers an exciting story of heroism and sacrifice taking fans back to the beginning of the Human-Covenant War, leading into the events of Halo 4, the biggest entertainment event of 2012. 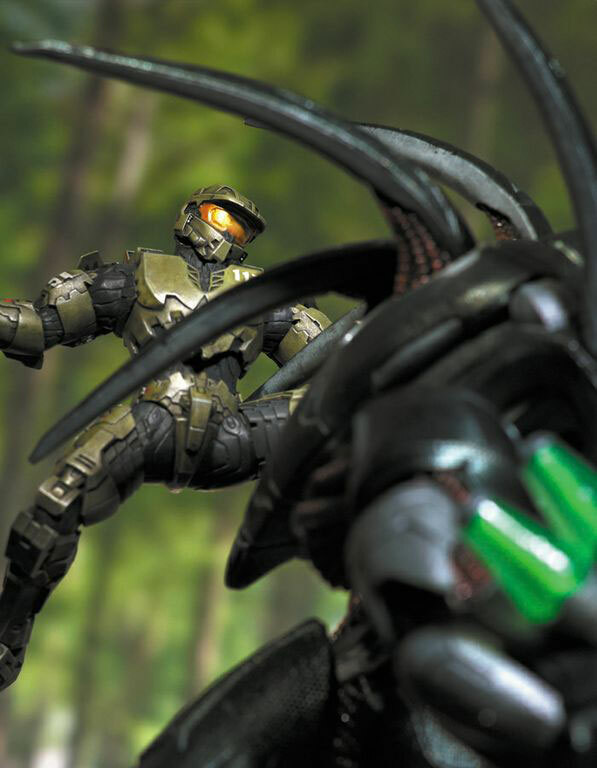 To commemorate this riveting action story, the McFarlane Toys Collectors Club is offering the first-ever Halo resin statue exclusively on the McFarlane Toys online store. 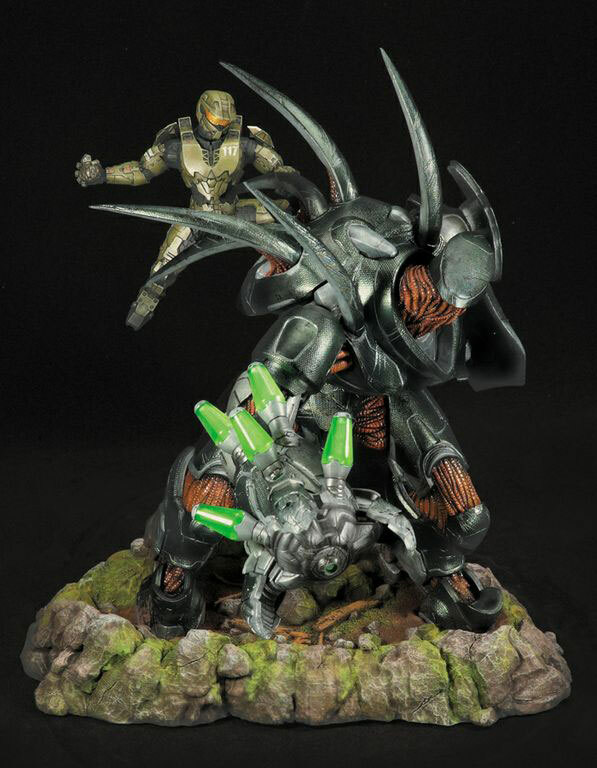 This highly detailed, hand-painted, cold-cast resin statue depicts a pivotal scene from Halo 4: Forward Unto Dawn that is a MUST have for Halo fans. 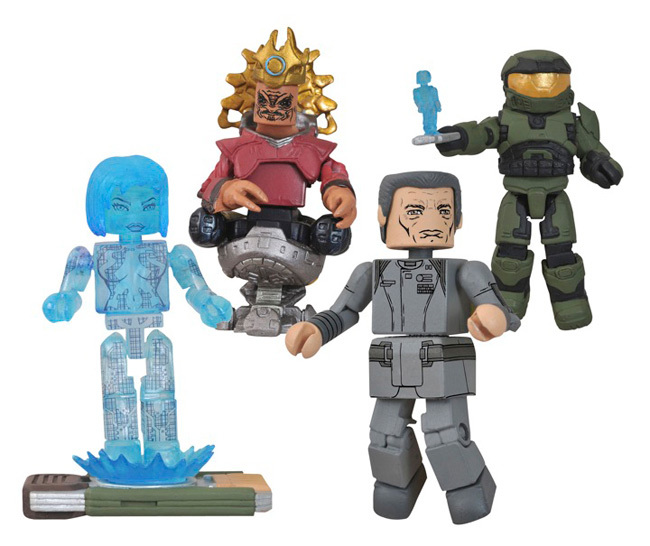 July 2012 - What is it about Halo Minimates that make them so addictive? Is it their collectability? Poseability? Interchangability? 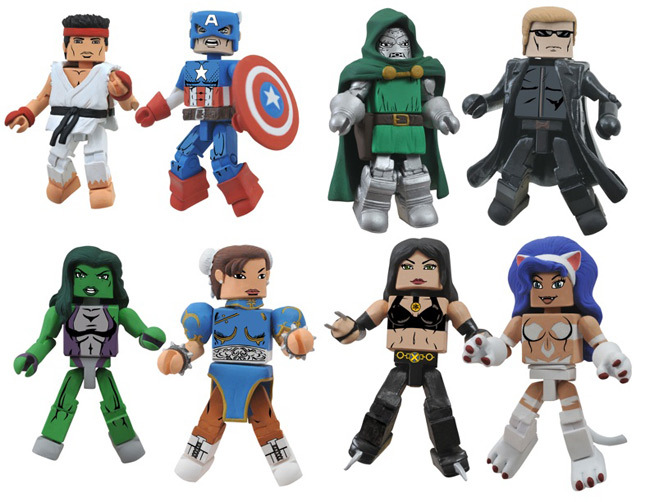 They certainly have a lot going on for a 2-inch mini-figure, and the new assortment from Diamond Select Toys has even more going on than ever before, with with enough extra parts to make army-building a snap! 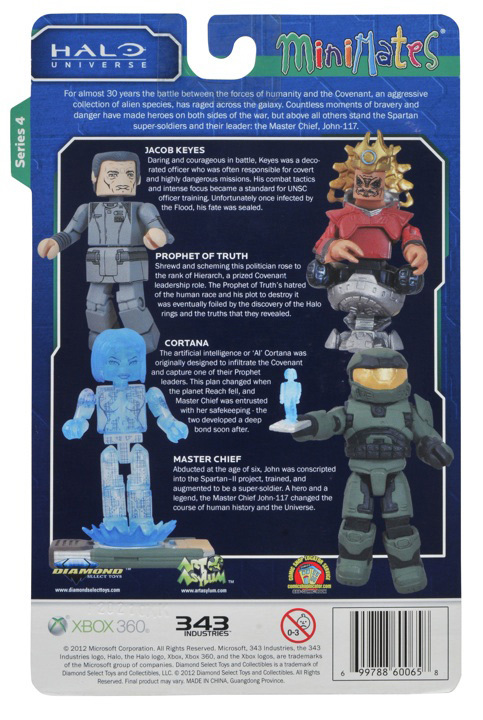 Read on to see all of the Spartans, Marines, Prophets and Elites in Halo Minimates Series 5! - The UNSC Marine and UNSC Sergeant come with two assault rifles, plus an extra helmet to turn your Sergeant into another Marine! DOUBLE MARINES! 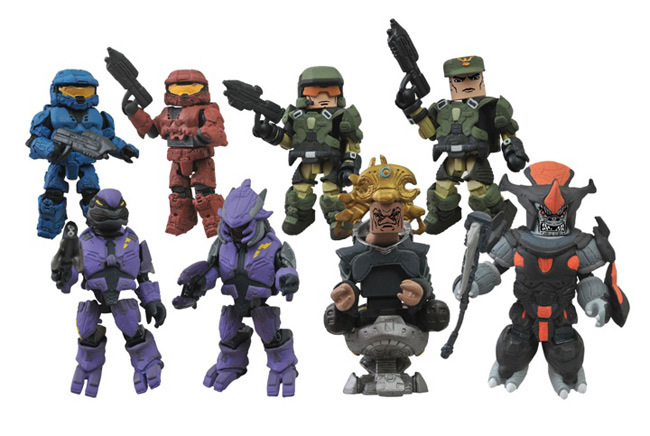 - The Red Spartan vs. Blue Spartan two-pack comes with two assault rifles and four extra helmets -- two Rogue and two ODST -- so you can add some diversity to your squad! May 2, 2012 - It's Wednesday again, which means it's time to visit Ye Olde Local Comic Booke Shoppe to pick up the latest releases. (It's also Free Comic Book Day, so some of those comics might not cost you a dime!) 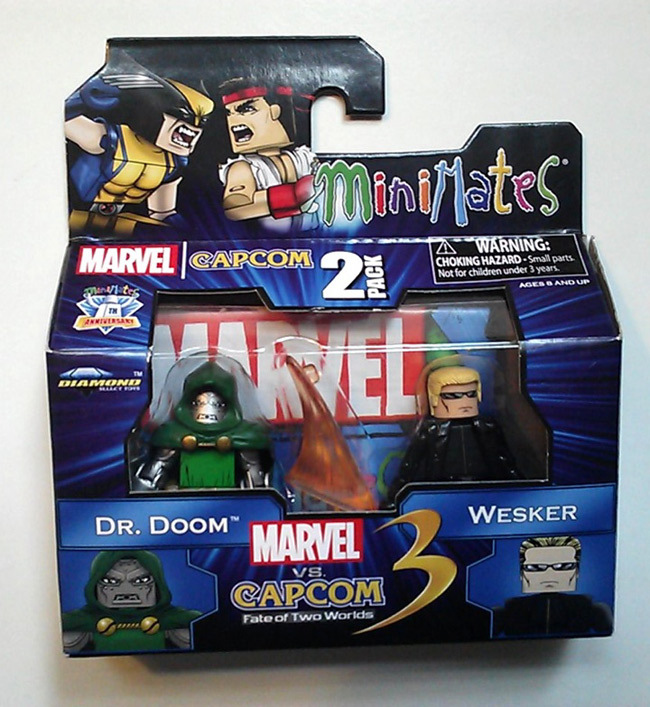 But besides comics, your local shop should also be getting in some sweet new Minimates from Diamond Select! Marvel Minimates Series 44, featuring some George Perez-style Avengers, and the Halo Series 4 Box Set, featuring Master Chief and Cortana, both hit stores today. If your local shop doesn't have them, order them today, or find an online retailer who can hook you up! Find your closest comic shop at comicshoplocator.com! And get regular DST updates on Facebook and Twitter! 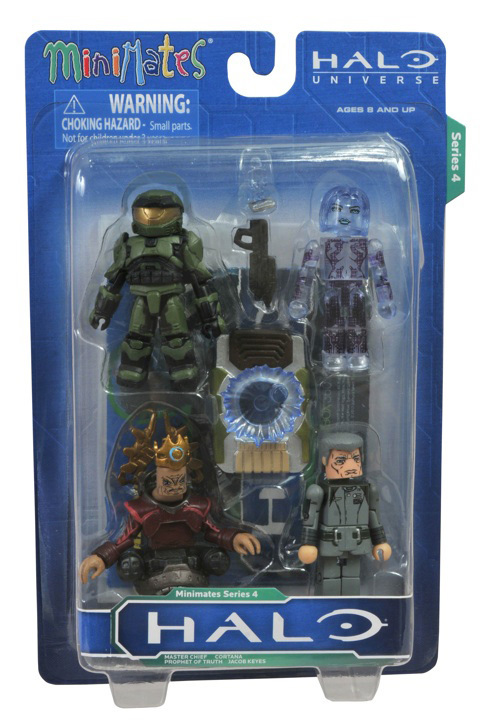 May 1, 2012 - The next series of Halo Minimates is hitting comic shops tomorrow and Toys "R" Us stores any day now, so we thought we'd show you the packaging for this amazing assortment. The two-packs will only be at TRU, the four-pack is only at comic shops and specialty stores -- both have Master Chief and Cortana, but the rest of the figures are only available at their respective locations! Check out the carded pics and collect them all! Pre-order the TRU two-packs at toysrus.com, and find your closest comic shop at comicshoplocator.com! And get regular DST updates on Facebook and Twitter!